Jalen Hurd changed positions, and teams in college football. Will his versatility help or hinder? Editor’s note: Welcome to the 2019 NFL Draft Video Profile series. Created by Andy Singleton and John Laub, these videos profile the best of the incoming 2019 NFL Rookie class. These videos will provide yet another terrific way to analyze the newest group of NFL rookies. Jalen Hurd has been on the college scene for what feels like a long time. First as a dynamic running back for Tennessee, and then as a wide receiver for Baylor. How much has the positional change added to his versatility and increased his 2019 NFL Draft stock as a prospect? Be sure to follow Andy Singleton on Twitter at @PeoplezPen and John Laub at @GridironSchol91. 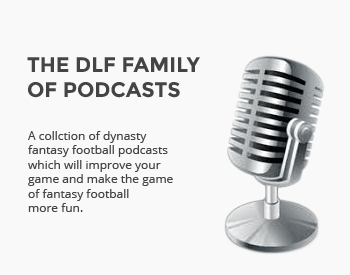 Their NFL Draft video profiles feature an introduction, background, and analysis all in approximately five minutes, and the entire series can be found exclusively on DLF. Check out the video profile for Jalen Hurd below, and share your thoughts with Andy and John! For a deeper look into college statistics, check out Andy’s new site ExpandTheBoxscore.com. One of NYC's Bravest, Andy has been a firefighter in Brooklyn for the past 17 years and counting. He broke into the fantasy industry in 2012 just looking for a way to share his passion for sports. His concentration has been on the NFL Draft, where he has attended the past five Senior Bowls, and Fantasy Baseball as well. He started out writing, moved into editing, then podcasting, and has now been self producing his various video series since 2015. Additionally, Andy just teamed with Brian Creagh to launch ExpandTheBoxscore.com, where advanced college statistics like targets, dominator ratings, red zone efficiency, and much more, are right at your fingertips.